Clover Center in Camp is basically a cornucopia for ethnic fashion. There are plenty of shops selling everything from hair clips and accessories, to shoes, jewellery, traditional-wear, fancy fabrics and material – and even tailoring shops to stitch your outfit for you. 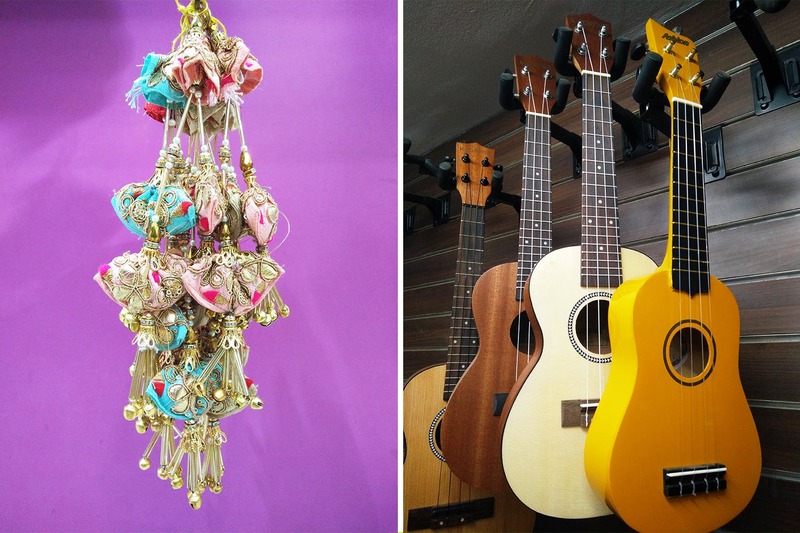 We decided to check out the shops that often get overlooked – and here’s what we found. Mohsinali’s Frames is a family-run shop, located at ground-level. If you have a postcard or a painting that you’d like framed, their rates start at INR 5 per running inch. We’ve been customers of theirs for years, and are happy with the quality and service offered. If you’re looking to add a bit of decor to your home, they also sell framed art prints in various sizes – starting from INR 650 for a small (14×14), and imported decorative mirrors – starting at INR 6500. They also have a smaller unit in the basement with home decor and fake (but still lovely) flowers, called Insiyah Creation. Sunshine Beauty Centre has two shops – one on the ground-level, and a larger one in the basement. They’re your one-stop-shop for all your beauty and cosmetic needs. From hair appliances, to beauty blenders, cotton face pads, make-up remover, embroidered handbags, and of course – make-up, and plenty of hair and body products. They also have their own line of nailpolish, and combs. We spotted a bunch of Nykaa’s own nail laquers as well, so keep that in mind. Read more about Sunshine Beauty Centre here. Anas Handicrafts is a family-run furniture business, over 30+ years old. Their specialty is artistic wooden furniture and knick-knacks, some of which are on display at their store. From elaborate large pieces like beds, sofas, and cupboards, stools, and chairs – they can pretty much make anything you want, out of wood. We found 5 cool smaller items that are worth a buy, which you can read about here. New Music Palace is a music shop – stocking (primarily) acoustic and electric guitars, and electric keyboards. Other instruments we spotted here were djembes (West African drums), mandolins, ukuleles, violins, flutes, harmonicas, and tambourines. The larger instruments are priced from INR 3200 (Indian-made) and INR 5000 (imported). You’ll also find tuning keys, cases, and gear. The shop can also service and tune your instruments, on request. If you’re planning on getting an outfit stitched, or want to jazz up an old one – you must make a stop at Lace Hut, in the basement. They stock a wide range of lace, zari borders, embellished borders, embroidered borders in a variety of widths, colours, and sizes. We also found some pretty latkans, which you can match with your border. Priced from INR 50 to INR 8000+, the embroidery and embellishing is absolutely gorgeous, and we had a hard time picking our favourite pieces. We also found a ‘secret’ liquor shop (that shall remain nameless, on request) at the ground level (in line with Mohsinali’s Frames), that stocks everything from miniatures to pints, and larger bottles as well. We picked up some of Moonshine Meadery’s meads, and also spotted a bottle of Honeybee Brandy that we’re going back for – next time. If you’re feeling peckish, drop in at Taste Factory (Shop no. S-73) – which stocks sandwiches, puffs, samosas, and other yummy eats and sweet treats (priced from INR 20 onward); as well as refreshing lassi, chaas, flavoured milk, and PaperBoat drinks.